Mike Napoli walked to begin the Boston eighth inning against Evan Meek. Napoli took second on Mike Carp's groundout to first and then was pulled for pinch-runner Jackie Bradley. Grady Sizemore - who singled in the second and homered to right in the fourth in his first major league game since September 2011 - struck out. Xander Bogaerts walked. Reliever Brian Matusz got ahead of A.J. Pierzynski 0-2 and got the Red Sox catcher to ground back to the mound. Tommy Hunter, newly anointed closer for the Orioles, began the ninth inning by plunking Will Middlebrooks with a 1-1 pitch. After Daniel Nava popped to third (ending an 0-for-5 day at the top of the lineup), Dustin Pedroia lined a single to center. With the potential tying run at second, David Ortiz flied to left and Bradley was called out on strikes. Boston left 12 men on base and was 0-for-10 with RATS. Despite the score looking like a pitchers' duel, Lester (7-6-2-1-8, 104) and Chris Tillman (5-7-1-1-4, 104) spent a lot of time working out of the stretch. In the 12 half-innings pitched by the starters, there was only one 1-2-3 inning (Lester's fifth). Boston pushed Tillman around a bit in the second, as Carp and Sizemore led off with singles. But Bogaerts flied to deep left, Pierzynski flied to deep center, and Middlebrooks was caught looking. With two outs in the third, Ortiz singled and Napoli doubled, but Carp ended the threat by striking out. Lester got ahead of Cruz 0-2 to start the Baltimore second, but ended up walking him on eight pitches. Cruz took third on Matt Wieters's flare over shortstop, and scored on an unusual 4-3-6 double play. After that, Lester did not allow an Orioles runner past first base until Cruz's dong to kick off the seventh. Cruz improved his career average against Lester to .458 (11-for-24). Pedroia's two singles meant that FY has hit in his first eight consecutive Opening Day games, something no Red Sox player has done for at least 100 years. The Red Sox are off tomorrow. John Lackey gets the start on Wednesday night. Will Middlebrooks is getting used to wearing contact lenses on the field. ... Shane Victorino had an MRI on his right hamstring yesterday and has been placed on the disabled list; Jackie Bradley, Jr. was called up. ... The 2004 Red Sox also began the season in Baltimore. They lost their first game, 7-2. Entries in the 2014 W-L contest. After analyzing more than 700,000 pitches thrown during the 2008 and 2009 seasons, we found that umpires frequently made errors behind the plate — about 14 percent of non-swinging pitches were called erroneously. Some of those errors occurred in fairly predictable ways. We found, for example, that umpires tended to favor the home team by expanding the strike zone, calling a strike when the pitch was actually a ball 13.3 percent of the time for home team pitchers versus 12.7 percent of the time for visitors. Other errors were more surprising. Contrary to the expectation (or hope) that umpires would be more accurate in important situations, we found that they were, in fact, more likely to make mistakes when the game was on the line. For example, our analyses suggest that umpires were 13 percent more likely to miss an actual strike in the bottom of the ninth inning of a tie game than in the top of the first inning, on the first pitch. Technologically, Major League Baseball is in a position, thanks to its high-speed camera system, to enforce a completely accurate, uniform strike zone. The question is whether we, as fans, want our games to be fair and just, or whether we are compelled to watch the game because it mimics the real world, warts and all. The National League predictions are here. World Series: Rays over Dodgers in 7. Fun Fact: Bogaerts is the youngest Red Sox Opening Day shortstop (21 years, 181 days) since Everett Scott (21 years, 146 days) in 1914. The Red Sox finish their spring training schedule today with a game against the Twins. They are off tomorrow and begin the season on Monday afternoon in Baltimore. Opening Day is only two days away, so here's a reminder to enter this year's Red Sox W-L Contest. 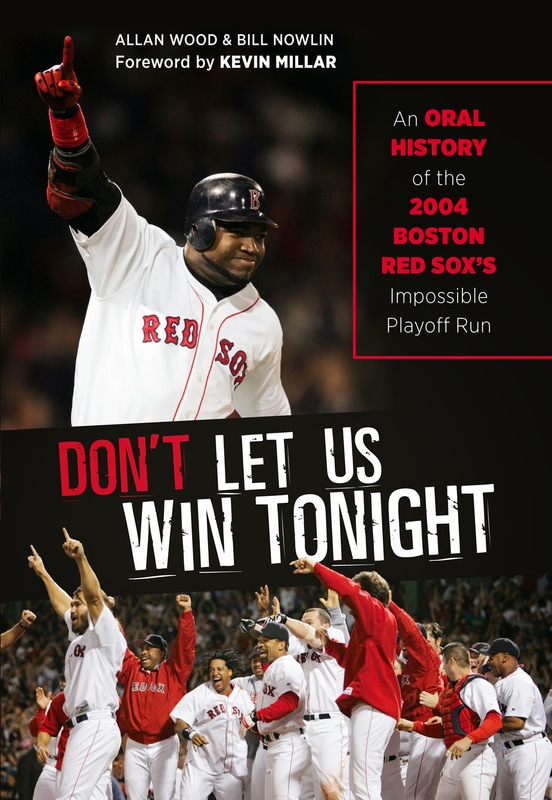 Correctly guess Boston's 2014 regular season record and win a few prizes, including a copy of Don't Let Us Win Tonight, autographed by both authors. W-L guesses must be exact. Tiebreaker winner will be the closest guess, either over or under. Slightly Extended Deadline: Monday, March 31, 9:00 AM. Add in the remaining two seasons on Cabrera's current deal with the eight-year extension, and it qualifies for the largest contract in baseball history, reportedly $292 million for the next 10 seasons. The deal includes vesting options for 2024 and '25 at $30 million each, which would be triggered if Cabrera finishes in the top 10 in American League MVP Award voting the previous seasons. It is hard to truly fathom how mind-numbingly horrible that deal is for the Tigers. Cabrera turns 31 on April 18. And on the heels of that comes news that Anaheim's Mike Trout has signed a 6/145 deal, buying out three years of arbitration and three years of free agency. And Trout will be only 29 when that deal runs out. Grady Sizemore was named the Red Sox's Opening Day center fielder - and Jackie Bradley, Jr. was optioned to Pawtucket. Sizemore was a pleasant surprise in camp this spring, hitting .333 and looking sharp in the outfield. John Farrell said that when the season begins, Sizemore would bat either fifth or sixth, not in the leadoff spot. Bradley batted only .158 and struck out a team-high 17 times. Back to work. Back to work. ... It's humbling. I've always known that, though. I don't really get too caught up in the highs, I don't get too caught up in the lows. I try to stay in the happy medium. Farrell says Daniel Nava will be the team's primary leadoff man. ... In an announcement that took no one by surprise, Jon Lester was named the Opening Day starter. It's Lester's fourth straight OD start. ESPN's MLB Preview is here. Buster Olney @Buster_ESPN: Turning the page on Boston's 2013 championship and refocusing for 2014 seems completely reflexive for the Red Sox players, given that a strength of Dustin Pedroia, Mike Napoli et al is to focus on each pitch in each at-bat in each game. They're ready for the next challenge. David Schoenfield @dschoenfield: The Red Sox led the majors in runs scored in 2013, scoring 57 more runs than the Tigers, but you have to wonder if they will have that caliber of attack again. They must replace Jacoby Ellsbury's offense in center field, whether from Jackie Bradley Jr. or Grady Sizemore, who hasn't played a full season since 2008, and hope that 38-year-old David Ortiz can have another big season and that rookie Xander Bogaerts lives up to the hype. In the rotation, Clay Buchholz was stellar when on the mound and John Lackey had his best season in years. Can they be that effective again? Closer Koji Uehara had one of the most dominant relief seasons ever but has never had completely healthy back-to-back seasons in the majors. Still, Boston's depth in the lineup, bullpen and rotation makes it a solid favorite to return to the postseason. ESPN is posting its individual predictions on Sunday. SI says the Red Sox are baseball's 6th-best team, 3rd-best in the AL. Utica Observer-Dispatch: "Relive The Baseball Party Of A Generation"
Don't Let Us Win Tonight has received its first review! 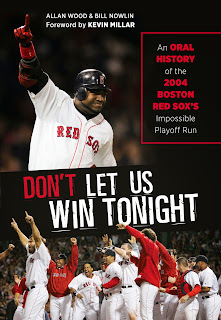 You're invited to relive the baseball party of a generation, all over again, in the pages of Don't Let Us Win Tonight. 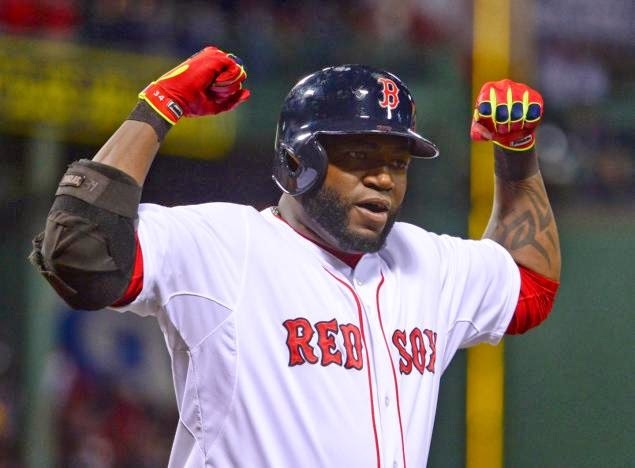 David Ortiz has very likely signed the final contract of his remarkable career. It looks like he's going to finish his career with the Red Sox. It's amazing to me that he performs at the level he does. He's critical to our offense nightly. ... You walk by and he's got a group around him. When he speaks, people listen. He's had so much success and a set of experiences that players look for him as a sounding board and to gain confidence. He walks in and all eyes go to him. It is difficult to describe David's contributions to our city both on the field and off the field, and we are so proud to have this ambassador of our game with us as he continues on this road to Cooperstown. 2017: Straight club option (no vest) at $10m that escalates at the same levels as 2016. If anyone is watching tonight's Red Sox-Yankees game and wants to thread, come back here at 7 PM. The major league club is talented throughout, with young talent sprinkled around a core of proven but ever-motivated veterans. ... 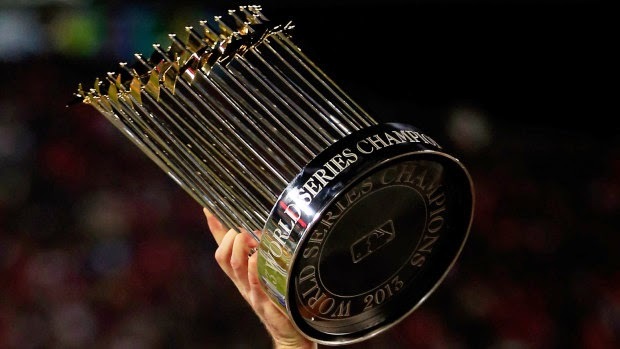 When the inevitable roadblocks present themselves after the season begins, their combination of minor league strength and financial power and flexibility should still give them the ability to be squarely in the conversation for the AL pennant. They aren't going away anytime soon. Eno Sarris tells some incredibly uncomfortable stories about finding his way as an interviewer in a major league clubhouse. 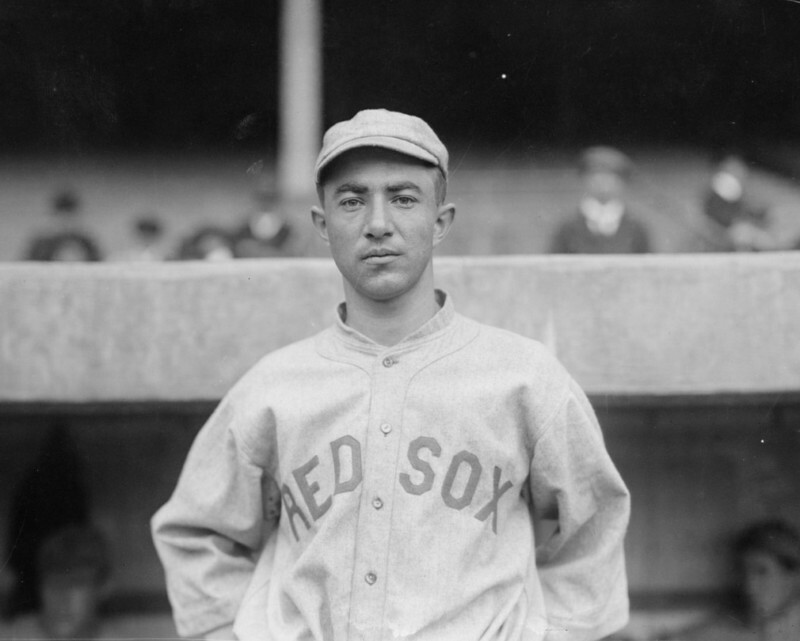 ... Tom Ruane of Retrosheet recaps some of the highlights from the 1914-1919 seasons. ... Joe Posnanski examines the myth of Louis Sockalexis and the naming of Cleveland's baseball team. When I really started getting into guitar seriously and learning song structure, the early R.E.M. records were a great basis because there wasn't a lot of overdubbing - it was just one guitar part and him playing the song. You could really tune in on what he was doing, His arpeggio style filled out the songs, and that was really how I learned a lot of what I do. ... If I had to rank [their albums], I would go "Lifes Rich Pageant," "Murmur," and then the rest. Same here. With "Fables of the Reconstruction", "New Adventures in Hi-Fi" and "Reckoning" (or "Chronic Town") rounding out the Top 5. The Red Sox are in spring training - ready to defend their third World Series title in 10 years - and I have posted next to nothing about it. What this lack of interest means for the regular season, if anything, I have no idea. 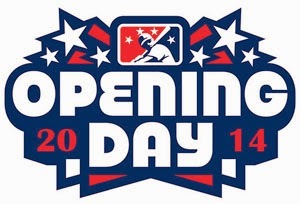 I'm pretty sure that once the games begin, I'll be back in the blogging groove (such as it is). Xander says Opening Day is two weeks away! Keri, On Red Sox: "Moneyball ... But With Money"
If almost everything went wrong for Boston in 2012, then almost everything went right in 2013. The Red Sox can hope physical therapy turns this team into baseball's version of the Steve Nash–Grant Hill Phoenix Suns, who enjoyed extraordinary team health despite carrying multiple injury-prone players. They can hope the bench keeps producing, the next generation of young power pitchers clicks, and the position prospects fulfill their potential. But it’s no sure thing. What is a sure thing, however, is that even if Boston fails to repeat this year, the franchise is in good hands. Instead of settling for a stars-and-scrubs roster, this team is putting thought into every little detail that goes into building a winner. The Red Sox are winning with money, and with Moneyball. In the here and now, Mark Teixeira, Brian Roberts and Derek Jeter are red-flag injury risks and Kelly Johnson is a neophyte third baseman. There is arguably no greater risk-reward infield in the whole sport than the Yankees'. They can have a high-production unit or a high-wire disaster. No matter the result, the Yankees are looking at a renovation for next season. ... [But] the Yankees simply have no answers coming. At the Red Sox spring training game yesterday, the public address man announced each pitch as either a ball or a strike, and then announced the updated count. After. Every. Pitch. Could the team have come up with a worse idea than "Call The Count"? The Globe reported that team president Larry Lucchino first raised the idea more than a year ago. It's an idea that people have been debating about at Fenway Park for more than a year. We figured, instead of continuing to debate about it in the abstract, let's use our spring training testing ground to put it into practice. ... The premise of the idea is the count is so germane to the outcome of the at-bat, and there's a greater emphasis on that right now by fans than there used to be. The unintended benefit that we saw today is that in our iPhone world, where your eyes are focusing on e-mails and texts, hearing the pitch and the count keep you posted and maybe your eyes go back up to the game when you hear it's a full count. The worry we had going into it was whether an announcer would be intrusive into the ambiance that you like to have. Anyone at the ball park who is curious about the count only has to look at one of several scoreboards around the park. Or, you know, simply pay attention to the game. Perhaps reading and sending emails and texts can wait until the half-inning is over. If not, then perhaps you don't really care all that deeply about the progress of the game. Certainly different in the atmosphere of the ballpark. Other than that, I really don't have any comment. I'm very traditional and it was a little bit different from what we're used to. People can decide what they care about and if they care about the count, they can turn their heads an inch and look at the scoreboard. Games are too noisy as it is. We need fewer distractions at the ballpark, not more. It was fair to say that players, who did not want to speak publicly about it, did not consider the experiment a success. The Red Sox should be cutting out distractions and unnecessary noise from games, not adding to the irritating cacophony. Stop the commercials between innings. Stop the excessive music (which, to cite only one example, has completely ruined the joy of watching batting practice). Pare the intrusions down to the absolutely essential. We come to the park to watch the game. Let us focus on the game. With Opening Day exactly three weeks away (March 31), it's time for this year's Red Sox W-L Contest! Deadline: Sunday, March 30, 11:59 PM. Grantland: Red Sox Now In The "Post-Nonsense Era"
 was the first Red Sox championship of the Post-Nonsense Era. At least one person received her copy of Don't Let Us Win Tonight this afternoon!